Heilongjiang Province (hēi lóng jiāng shěng 黑龙江省) is called Hei (hēi 黑) for short, with Harbin as its provincial capital. With expanse of flatland and wide areas of fertile black soil, it is one of China's major commodity grain growers. Named after its largest river, its land area includes the country’s largest oil reserve. Lying in the northernmost part of northeast China, Heilongjiang Province is the province with the longest winters. And with the development of society, it has become now one of the well-known tourist destinations in China. There are a variety of special interest tours catering for tourists such as the ice and snow tour, the forest tour, the summer resort tour, and the border (between China and Russia) town tour. The Crater National Forest Park is 50 kilometers to the northwest Jingpo Lake (jìng bó hú 镜泊湖), which is located in the deep mountainous areas of Mountain Zhangguangcai (zhāng guǎng cái lǐng 张广才岭) with the elevation 1,000 meters. It is a piece covered with the precious tree seed's virgin forest including the red pine, the purple tree, the yellow pine, the scale pine trees, the Chrysanthemum pine and so on. The area amounts to more than 66,900 hectares, which is a natural green treasure house. It is renowned at home and abroad for the "crater underground forest". The country lists it as the national level nature protection area. Sandaoguan National Forest Park (sān dào guān guó jiā sēn lín gōng yuán 三道关国家森林公园) is located in the suburb of northeast of Mudanjiang (mǔ dān jiāng 牡丹江) City, which is 20 kilometers apart from the town center. The four season’s landscape is beautiful here; in spring flowers colorfully grow, in midsummer the shade looks like a lid, in the golden fall red leaves decorate the whole mountain, in winter it is a beautiful snow world. 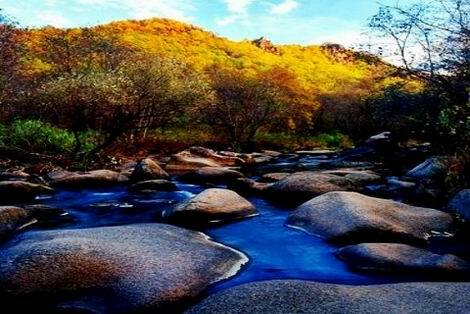 It is famous for beautiful mountain, clear water, and slim stone and silent forest. The main landscapes include: Mountain Daiwang (dài wáng shān 岱王山), the fairy cave (xiān rén dòng 仙人洞), Narrow sky (yī xiàn tiān 一线天), the couple stone (fū qī shí 夫妻石) and so on. The Snow Castle in Mudanjiang City boasts its present status of No.1 in the world in terms of area coverage, snow used and active involvement, which can rival those in Kemi (kǎi mǐ shì 凯米市), Finland, and in Sapporo, Japan. Each year, the Snow Village will be planned and constructed featuring different motif, which has become a focus of attraction in the winter tours of Heilongjiang Province and as such tourists from various places come with admiration for its reputation to experience and enjoy the charm of these art treasures. It is the Snow Castle in Mudanjiang. Located in the territory of Tangwanghe District (tāng wàng hé qū 汤旺河区), Yichun (yī chūn 伊春) City, Heilongjiang Province, Tangwanghe National Park (tāng wàng hé guó jiā gōng yuán 汤旺河国家公园) is the first national park approved in China. It has unique tourism resources with the advantage of particularly favorable forest and ice & snow.